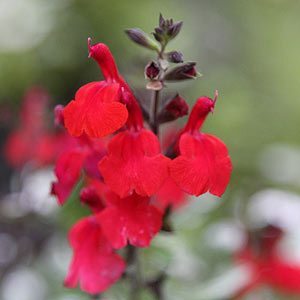 With flower colors from white to red and tangerine, Salvia greggii is becoming available in a number of varieties. Some seem very similar to one another, others have a unique charm. Whichever variety you grow, these are a reliable garden plant that require little care once established. Salvia greggii is commonly called the ‘Autumn Sage’, although its main flowering season from spring through summer. This is an attractive bushy plant well suited to a cottage style garden or a small corner in the border. It will reach around 1m (3ft) and is fairly hardy. As this is a species that tends to self seeds, lots of varieties are available, some unique. Flower color varies from brilliant red trough the pinks and yellows to white. A few mauve flowering types are available, however no real blues that we have seen. S. greggii ‘Crimson and Black’ with its stunning red flowers. S. greggii ‘Raspberry Royal’. – Compact growing variety with Raspberry pink flowers to around 50 cm in height. S. greggii ‘Icing Sugar’ – With bi color flowers of pale and deep pink, compact grower to 50 cm. Why the ‘Autumn sage’, well although Salvia greggii flowers in summer it also holds its flowers well into autumn. Drought tolerant and easy to prune back near the end of winter as the temperature begins to warm a little, to keep in shape. S.greggii cultivars are a shrubby plant that will benefit from pruning immediately after flowering. Simply prune them back by 1/3 at this time of the year to a rounded mound. They will look a little strange as a neat mound of twigs, however they will bounce back quickly and in spring you will have a well shaped plant with masses of flowers. If you miss the summer pruning, wait until spring, especially in colder climates.